AtomArt Gallery is proud to open 2019 with self-taught artist Richard Halprin of The Inkling Fountain. 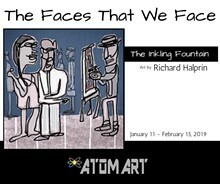 “The Faces That We Face” exhibits from January 11, 2019 – February 15, 2019. Opening reception takes place on Saturday, January 12 from 4:00 PM to 10:00 PM with live music, hors d’oeuvres and refreshments. Save the date & plan for a perfect date night for Valentine’s Day! Closing reception takes place on February 14, 2019 from 6:00 PM to 10:00 PM. Since 2014, AtomArt Gallery has provided space for private events in addition to exhibiting works of art by fantastic artists. This fine art gallery continues to bring profound and often never seen before masterpieces into the public eye. Located on 9 Mile; just a few blocks East of Woodward Ave., in Downtown Ferndale among award winning restaurants and boutique retail, AtomArt is a destination for all to see.